This is Jacob's greenhouse located at Jacob's Aquarium HQ! This is where all of our plants are grown, packaged and shipped! Inside the greenhouse we have a gigantic pond we use to grow all of our aquatic plants. We call it "Super Pond." Designed and built by Jacob himself! The pond is 1,200 gallons and contains over 70 different species of aquatic plants. The pond is filtered through a 2" PVC overflow using a giant 2" schedule 80 bulkhead installed on the side wall of the pond that leads to a 100 micron sock located inside of a 80 gallon sump filter. Inside the filter there are three 1,000GPH return pumps and a small 100GPH pump used for our 9 watt UV sterilizer. A twenty pound tank is used for a constant supply of CO2 and liquid nutrients are dosed on a weekly basis to keep the plants in excellent health. 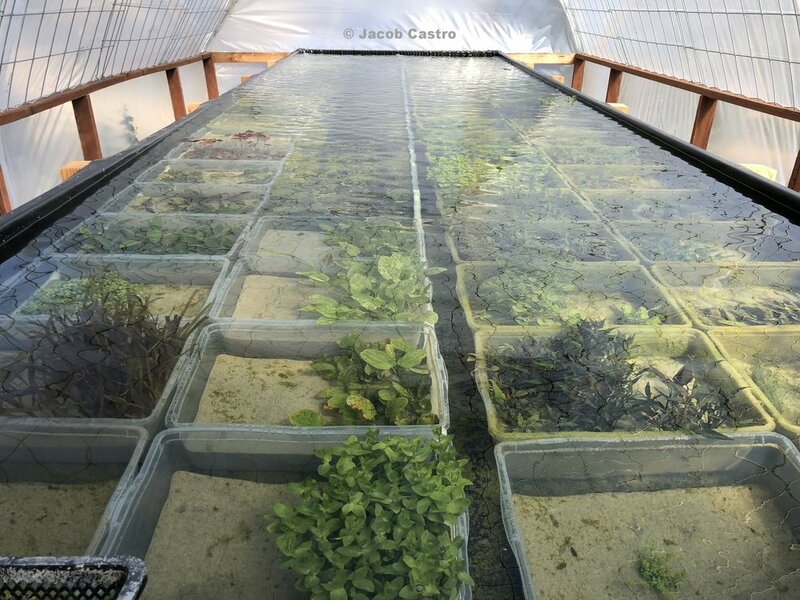 All of our plants are grown in plastic containers, submerged in the pond. Each container is dedicated to one plant; keeping our system organized and preventing mix ups. A combined 1,000 pounds of silica sand is used throughout these containers as substrate. During the winter the pond is heated with three 300 watt Eheim heaters and on days where sunlight isn't that plentiful, lit with a Kessil H1200 LED grow light. On a weekly basis, pumps, plumbing and filter socks are cleaned and once a month we perform a 25% water change. On a daily basis all of our plants undergo a rigorous health inspection to insure we are providing the healthiest specimens possible to our customers.